Feng shui crystals are commonly used tools for the art of placement. These crystals are usually not the type that are typically worn as jewelry, they are multifaceted spheres that come in a range of sizes and colors. The crystal balls are supposed to be hung in specific areas of a home where it is necessary to activate the 'qi' or energy. You will find some areas with stagnant 'qi', the energy cannot flow freely unless you have special feng shui tools to place there such as a crystal ball. These spherical balls range in size from 20mm to 50mm. 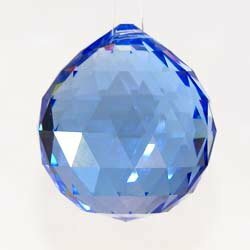 The scale of the ball should match the dimensions of a room, for example bigger crystal balls are better fitted to bigger rooms and vice versa. A ball that's 40mm or 50mm is generally placed in large rooms such as a living room, ones that are 30mm is appropriate for a bedroom, and 20mm is ideal in a bathroom. A lot of people also use 20mm balls inside of their cars. Clear crystal balls are the most commonly used, known for having the ability to activate the 'qi' of a whole space. Other colors include pink, purple, blue, green and more. You should use these specifically to improve different areas of your life in which the color is meant for in the right location. To seek out the best location for these colored balls, simply use a bagua map to determine where each color belongs within a given space. Then hang the colored ball in the appropriate area. There happens to be quite a few structural issues in a home that would require the crystal ball to act as a remedy. As an example, if ever the front door leads right into a staircase, the flow of 'qi' is going to be affected the minute it enters the home. Hang a crystal in between the front door and staircase. Other problem areas include long hallways, an entrance which is missing an actual door or corners with sharp edges. Furniture placement will sometimes interfere with the flow of 'qi' and if rearranging it is not possible, crystal balls can be utilized for a simple fix. For best results, hang the crystal ball on the ceiling using a red string. The length of string can also play a factor, multiples of 9 are supposed to be the most effective length. Make sure the string is either 9 inches, 18 inches or 27 inches. Dust can accumulate easily on these balls, make sure to clean them regularly. Layers of dust will only make them less effective. With the proper use and care, feng shui crystals can prove to be very powerful tools. Feng shui crystals are really popular good feng shui remedies, used on areas with bad 'qi' or energy. Use different colors and sizes in different parts of a room or an entire home with the help of a bagua map.